Simulating the evolution of the charge-state of fast projectile ions in dense targets is a quite complex problem. The ion suffers successive collisions with the atoms of the bulk, which are responsible of its slowing down. They disturb its electronic cloud through elementary processes such as electron capture, ionization and excitation. 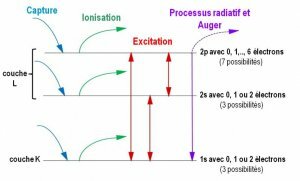 At high velocity, ionization and excitation dominate while capture becomes negligible and a perturbative treatment is then applicable. By decreasing the ion velocity, all the processes end up playing an equivalent role that make the modeling much more complicated. The team « Clusters and Surfaces under Intense Excitation » of INSP, in collaboration with Argentinean theorists, develop the only code that can predict the evolution of ion charge-state distributions as a function of the solid target thickness for a wide range of collision velocities and by taking into account ions with up to 60 orbital states of electrons. Eq1 where Yi(x) stands for the fraction of ions in a specific i electronic configuration, and σij for collision cross sections or transition rates from state i to state j. Contrary to other approaches, in our modeling, the nl ion sub-states are examined with n, the principal quantum number, up to n =4. For each nl state, configurations corresponding to 0, 1, 2,…or 2(2l+1) electrons in a given n shell and all the electronic processes changing the population of those states are then considered as illustrated in Figure 1. 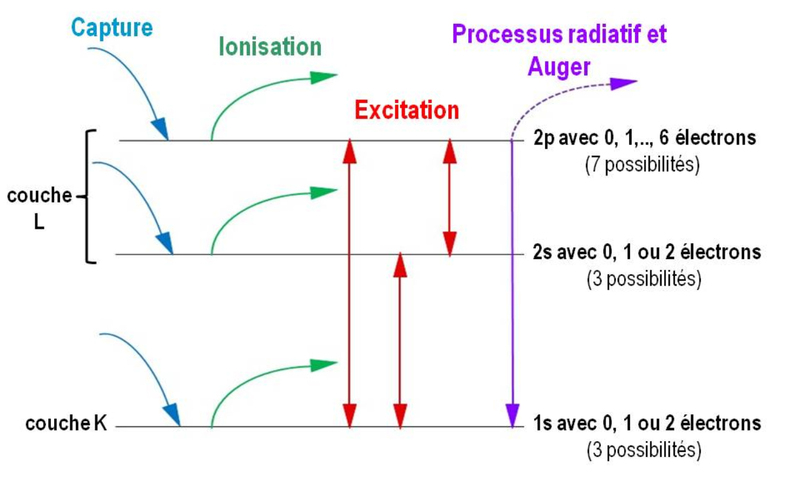 Illustration, for n = 1 and 2, of the different processes acting on the n ion population. All populating (σij) and de-populating (σij) cross sections are evaluated in order to solve the different equations (Eq 1). In the uppermost version of the code, the evolution of 1283 electronic configuration Yi is examined. The final charge-state distribution is calculated by summing over all configurations with the same number of electrons. The probabilities related to the different mechanisms acting on the ion state populations depend strongly on its atomic number, its velocity but also on the solid atomic number and density. So as to enlarge the validity domain of our code from the perturbative to the non-perturbative regime, we have introduced routines based on the most sophisticated calculations developed by our Argentinean colleagues. Moreover, after each integration step, mean populations in each shell are recalculated, and used to estimate the averaged cross sections. Finally, all cross sections are recalculated with the appropriate new screening constants each time the mean charge state of the projectile, and/or its energy, changes by more than a few percent. Figure 2 shows the reliability of ETACHA predictions compared with experimental results obtained when lead ions with initially 26 electrons go through carbon or silicon targets. The left picture illustrates the capability of our code to reproduce both, the ion fraction with high charge state at large target thickness and the extinction of low charge state ions at small thickness. The right picture shows the good agreement on the whole charge state distribution for a given target thickness. Experiment-simulation comparisons for lead ions with an initial charge state of 56+ interacting with carbon or silicon solids : the left figure gives the evolution of the ion charge state distribution as a function of the carbon thickness (note : 10 µg/cm² = 50 nm) ; the right figure show the whole ion charge state distribution for a Si crystal of 1.1 µm. The ETACHA code is already used by many physicists working on the production of intense multicharged ion beams at large scale facilities such as GANIL in France, GSI in Germany, Riken in Japan, Argonne National Lab in USA,… Moreover, it is of use for optimizing or interpreting studies on the damage of irradiated materials in solid-state physics, the production of super-heavy elements (Z > 100) in nuclear physics or the Warm Dense Matter characterization in plasma physics as it has been recently proved.